In the heart of Athens Exarchia Square, a Palestinian refugee youth from Ein El-Hilwa refugee camp in Lebanon sits to tell me of the sobering reality offering refugee support services in Greek camps has taught him. By now, Exarchia has cleared of the international volunteers who come for the summer to offer “help” and of tourists who maintain Greece’s devastated economy in nightclubs and coffee shops during the holiday. What is left is a surreal exchange of many worlds that are vibrant with possibility for solidarity because a shared sense of despair unites Exarchia’s constituents. Refugees and migrants from across the Asian and African continents chain-smoke cigarettes as they wait away the uncertainty of their time in Greece. They lend tips to one another on how to navigate the complexity and bureaucracy of the Greek and European Asylum system and the non-governmental organizational industry. Every few minutes, the chatter amongst them is interrupted so that they may check their smartphones for news. Phones surface the multiplicity of anxieties refugees experience. They communicate death and destruction in the homeland, danger and risk of the migration voyages, and the misery and loneliness of being trapped in a detention center, camp, or a no-man’s land. Even so, they are tools for survival. It is the means that gives them a gateway to the world and to its possibilities. Phones communicate the best ways to navigate the death waters and desolate shores; contacts for help, safe sites for rest in the migration passages and where and how they might receive medical or humanitarian assistance. During the day, Exarchia is a site of exchange among refugees, mostly young people, communicating in many languages with one another. At night, the life of these refugees intersects with the complexity of the Greek political, economic, and social landscape. On the evening of Wednesday, December 6, 2017 Exarchia’s streets were closed off by garbage cans lit in flames guarding protestors from Greek riot police forces. The day of action was to commemorate the nine-year anniversary of the Greek police murder of 15-year-old Alexandros Grigoropolous, an event which catalyzed the riots in Greece against totalitarian rule, policing, militarization and mandatory conscription policies. An Anarchist stronghold, it is not uncommon to see daily clashes between youth and the Greek police in Exarchia. What continually gears into motion youth protest is a profound expression of rage against the Syriza and ANEL coalition government led by Prime Minister Alexis Tsipras. In June of 2015, the Greek people voted by an overwhelming majority to reject the economic bailout conditions proposed to them by the International Monetary Fund (IMF), the European Commission and the European Central Bank (ECB). The vote shocked world leaders. But it had also inspired in leftist formations and movements across the world senses of democratic zeal. The vote demonstrated that everyday people had reached a point of exhaustion with and refusal of neo-liberal debt economies and that their courage necessarily demanded and relied on an alternative to the capitalist world order. Despite the peoples clear message to the EU, just a few weeks after the vote, Tsipras’ agreed to a three year-bailout which resulted even more extreme austerity measures than what the original referendum had outlined. Since then, youth express that the dream of electing the Coalition of Radical Left (Syriza) has resultantly led to increased political despair among young people. The deal led to amplified privatization of the country’s fragile economy, tax hikes and made the Greek unemployment rate a whopping 35%. With an average Greek salary of 18,500 Euro per year and skyrocketing costs in the country, Greek youth despair and anger has soared alongside that of refugees who are almost fully ejected from the Greek economy and labor market. These shared sensibilities have fostered new conversations among those constituents experiencing crisis. Refugees in Greece at times witness and other times partake in Greek political action. Burned down cars and the remains of Molotov cocktails suggest a protracted war persists in Exarchia. But screams in the night echo across the streets in Greek, English, Arabic, Farsi, Dari, Urdu among many other languages. It begs the question, who is it that is experiencing crisis, who is fighting and for what purpose? Muhanned, an Afghan refugee and community organizer in Athens tells me “The refugees partake in Greek political actions, but it depends on the cause or issue and it depends on what is happening with the shifting EU and Greek migration and refugee policies.” Certainly, Exarchia has become home to refugees from an array of ethnic and national backgrounds. Their time together, and amidst the vibrant Greek anarchist scene in Exarchia, has fostered new affinities and solidarities among one another. But broader Greek and European asylum and refugee policies also facilitate tensions among refugee communities. They do so by first, creating a constant sense of scarcity. On March 20th, 2016, the European Union (EU) and Turkey reached a deal which would allocate higher quotas for refugee resettlement within EU countries so long as refugees would arrive directly from Turkish airports. In exchange, Turkey, Greece and other EU countries were required to tighten their borders, implement new border control policies including increasing the number of detentions and deportations for any refugee/migrant who had not arrived through the proper resettlement pathways. The deal, however, stipulated that the opened quotas were only for Syrian refugees and other determined war-refugee populations and subsequently closed off pathways for safe and legal passages for other communities. In the end, thousands of refugees became trapped in Greek islands in detention centers and camps and thousands more in Athens. Many of these refugees, most of whom are youth, wait to see if any possibilities might emerge to leave Greece legally to a country where they could attain residency, a necessary requirement to work, and refugee support services. Many more attempt to continue their migration journeys which have become more difficult, dangerous, and expensive as smugglers take advantage of a booming industry. For the thousands of refugees trapped in Greece with no legal mechanism to become naturalized, who do not want to become naturalized because of the difficulty of being able to survive economically in Greece, or who do not have the financial means to pay smugglers to complete their migration routes; they find ways to survive. They turn out in political movements in Greece alongside Greek youth finding ways to express their rage against the Greek police. They are hoping to effect change. In other moments, they discretely navigate survival strategies to avoid the risk of deportation. But the protests in Greece, especially Exarchia, shift as quickly as the turn of global events. On December 7th, 2017 the day after the anniversary march commemorating Grigoropolous’s murder, protests persisted throughout Exarchias’ streets. This time, the protest was organized by Kurdish refugees standing against the visit of Turkish President Recap Tayyip Erdogan, which would be the first Turkish Presidential visit to Greece after 65 years of political tensions and dispute over territorial sovereignty. With rising tensions between Turkey and Greece, an array of perspectives are shared in conversation in Exarchias parks and coffee shops. Kurdish refugees argue that demonstrating against Erdogan is an essential component of standing against Turkish ethnic cleansing policies against Kurdish peoples historically and against international immunity granted to Turkey. On the other hand, Greek leftists critical of their own government argue that they are sorely aware that Greek politicians contribute to generating moral panics about a possible Turkish offense on Greek soil and in so doing, they foster militarized mentalities among Greek nationals and legitimize continued militarization of borders, mandatory conscription policies, expanding military development of the Mediterranean and surveillance and repression industries. Dimitri, a Greek youth organizer argues that Greek nationalism becomes deeply affiliated and enshrined in Christianity and therefore part of the Western imaginary while Turkey can come to signify Islam and therefore the East. Amidst growing regional hostilities, the Greek government is not exempt from buying into the fold of the broader Western backed War on Terror program and deepening its alliance with the vanguards of that front including the Israeli state, despite its empathy for the Palestinian struggle and its leftist character. The intersection of political issues, the diverse range of constituents involved, and the overwhelming systemic disenfranchisement the Greek people endure, makes Greece, especially Athens, particularly Exarchia, a microcosm of world struggles all found in one time and space. The chatter in the streets and metros suggest that Greece is on the brink of revolution or at least in a protracted struggle which can burst into flames in any moment. Anarchist formations coordinate with other forces in Exarchia to protect the squats that house refugees from being raided by the state or from members of expanding neo-Nazi political forces, such as Greece’s Golden Dawn political party, which have organized militant attacks on refugee camps across the country and especially in Greek islands. And certainly, right wing forces construct a certain idea about the youth in Exarchia that starkly parallels the way political dissent, and non-normative racial and gendered bodies are deemed criminal, deviant, and violent in many places of the world. Some months earlier, in August of 2017, in a Taxi ride from Monastiraki—one of the main Athens tourist attractions—to the Patsion neighborhood, I drove by a gathering in a park which was to celebrate the anniversary of Pakistan’s Independence from British colonial rule in 1947. The taxi driver uttered, “You see this, why should they do this here, Greece is a Christian country!” That same week, I had gone with a daughter of a friend, who was herself a refugee from Syria, to the mall to purchase back to school supplies for some of the refugee youth in the program I was volunteering in. The young girl and I sat in the food court chatting and she saw a small stuffed animal keychain on the backpack of a Greek girl sitting with her family. She asked me where she might get one of those and I didn’t know. I encouraged her to go and speak with them and practice her English. She did. But before she could say anything, the parents gave her a hostile look, and told her “we don’t have any money for you.” It is not easy being a refugee in Greece, not only on systemic levels but in the everyday ways one’s political status is too a racialized one and deeply embedded in the global re-configurations of racial warfare following September 11, 2001. This is in part one of the reasons Exarchia offers a temporal and spatial breach to those everyday forms of hostile antagonism and taunting refugees might engage elsewhere in Greece. It is not uncommon to see reflections of revolutionary practice in quotidian forms in Exarchia as well. Here, many dig into their pockets searching for spare change to give to those who sleep in the streets whether they are run-away Greek youth, refugees, and/or people with mental health struggles. Greek locals volunteer to make food in the kitchens in squats and community centers. Refugees have partaken in supporting other refugees with various needs including medical services because of the negligence of run-down Greek hospitals. They find ways to make up for and simultaneously critique and expose the constrained rubrics of who is eligible for service by international Non-governmental organizations. They get what they can from these organizations, sometimes successfully, sometimes triggered by the way NGO’s do not always practice trauma-informed service and consent-based practice, and they make do with what they have. In Exarchia, coffee shops and bars are covered in posters that iconize revolutionary intellectuals and that promote an upcoming film screening, lecture, music concert or protest mobilizing Athens’ enraged youth. Exarchia square features posters that declare international solidarity with other places and communities including with Standing Rock, Ferguson and Palestine. In the windows of bookstores lay political pamphlets and critical theory texts on anti-capitalism, anti-militarism and historical revolutionary struggle in many languages. Exarchia’s local inhabitants tell of which neighborhoods, bars and coffee shops convene which communities–Trotskyist, Anarchist, Communist–and so forth. The diversity of political left ideologies is pervasive and incredibly pronounced. Each inch of wall space covered in graffiti of political slogans creates a sort of nostalgic reminiscence to the era of the 1960’s internationalist insurgency that young leftists across metropolitan cities in the West revere. The revolutionary political sensibilities among Exarchia’ youth are truly global and the refugee youth both contribute and are becoming informed by that social-political fabric. On Monday, December 11, 2017 Greek youth flocked to City Plaza Squat, a ten-minute walk from Exarchia square, to listen to a talk given by political icon of the Black Power movement in the US and former political prisoner, Angela Davis. Conversations that question the role of the young generation in politics is not limited to Greek youth circuits. Among refugees, conversation about what to do, how to survive, where to live or go, all connects to a political analysis of why they are refugees in the first place. They criticize many players which they attribute to playing a role in their own struggles. Global actors which created and have profited from the wars in their region; non-profit aid workers who they argue are at times more concerned about their salaries than they are about helping people “for real”; and dictatorial regimes in their own countries which committed mass killings and exoduses to protect their own positions of power. Young refugees from various ethnic, racial and national communities argue that the youth of the current generation are worse off than older generations; that youth must find a way to enact change; and that if it does not happen with this generation, it may be too late. In Athens, Palestinian refugee youth also gather in various homes, offices, centers and camps, debating a way out of the Palestinian political predicament and particularly, thinking of methods that might actualize their refugee return to Palestine. On Friday, December 8, 2017, hundreds of young Palestinians and Arabs poured out onto the streets in front of Athens Syntagma square, a fifteen-minute walk from Exarchia, in preparation for a march which would converge with Greek organizations en-route to the US embassy. The night echoed with chants against Donald Trump’s announcement to recognize Jerusalem as the capital of Israel and the intended move of the US embassy from Tel Aviv to Jerusalem. Palestinian organizations called for a “Day of Rage” and the language of rage dominated news and social media. Mass protests had, rightfully so, swept across major cities across the world. The rage of masses, especially youth, begged the question of whether we were to witness the beginning of a third Palestinian Intifada (Uprising). The Palestinian youth I spoke with at the march each conveyed views that this move could allow for Palestinians to break from the exhausted paradigm of the 1993 Oslo peace and negotiations which had pummeled Palestinian unity and resistance and subsequently resulted in the escalation of Zionist land-theft, occupation and ethnic cleansing. A shared expression of anger at the Palestinian political establishment was evidenced in some of the chants that the youth yelled critiquing former chairperson of the Palestine Liberation Organization (PLO) Yasser Arafat as well as the Palestinian National Authority (PNA) for its corroboration with Israel. Yet, the youth also sang songs that argued against Palestinian factionalism entirely. Their chants conveyed that Jerusalem was a uniting cause for the Palestinian people, for the Arab dimension, and for Muslims across the world. The protest for Jerusalem in Athens reflected a convergence of the multiplicities of Palestinian youth communities and colonial conditions in one time and space. The local Palestinian community in Greece included student, youth and community organizations as well as Palestinian unions with various political leanings. Many of the youth present were Palestinian refugee youth from Syria, Gaza, Lebanon among many from other Arab refugee populations. A Palestinian youth from Gaza guides me through the protest to tell me of the distinct populations; “see there, those are the Palestinians from Gaza, there are many of us, we stick together in the big spaces, but generally we are all at a war with each other as well. You see over there, those are the Palestinians from Syria. I am friends with many of them, but the two groups [Syria and Gaza] don’t mix well with one another.” He continues to tell of how this declaration is bound to unite Palestinian communities and that though we have many divisions among us, especially in the context of the various wars taking place in the region particularly regarding Syria, Jerusalem will remain a red-line and a mobilizing catalyst for us all. The response to the Jerusalem declaration coupled with witnessing the (im)possibility of refugee survival and solidarity in Athens has led me to ask myself and other stakeholders in struggle; is rage the same as resistance? What can rage contribute to resistance? How can rage, anger, pain and misery lend itself to generative political possibility if infrastructurally, little space exists for political strategy development? Without an organized sphere that can maintain the direction of rage, who will bear its violence? The conditions of the world don’t allow for rage to dissipate. Rather, we must understand rage’s motion if not directed through a political calculus. If turned inward, rage can obscure who we are fighting, for what purpose, why, and how. In part, the absence of revolutionary direction for our rage contributes to the causes of civil wars and sectarian violence that has destroyed our homelands and institutionalized corrupt and despotic regimes who have made alliances with colonial and imperial forces at the expense of true peoples’ sovereignty. And that mis-direction of our rage has made it so that these despotic regimes play a critical role in producing the crisis we are enduring and/or witnessing today. Crisis is familiar anywhere, because it is happening everywhere. What is then “the crisis?” It is a crisis of young people from across the global South facing the barrels of guns in higher numbers, or disposed into untraced ditches, valleys and waters with their families left to wonder where they are, or of babies and children locked up in cages at the borders of the world super power or of human bodies branded like chattel and sold into trafficking markets. The historical ails of the world, and the stains on global human consciousness, have calcified in the current moment and we now live at the edges of its extremities. The importance of Athens, especially Exarchia, is not that it offers a new direction for rage, ideology or formation which can solve the worlds ails. Rather, it is a place that offers an organic process in which communities most affected by systemic violence and the greatest stakeholders for transformative change, are globalizing their understandings of power and pain. Athens signifies the break of the nation and a possible iteration of an out to its crises. Athens signifies how rage can set a foundation for new conceptualizations of who constitutes the collective “we.” Athens highlights the overlap of the various geographic coordinates of war and exile. Athens reflects the tenuous struggle between a world divided by the free and unfree, the human and the disposable, the global North and global South. Athens demonstrates the betrayal of the institutional left. Athens illuminates the need for a new political alliance across boundaries that does not count on any nation-state as our vanguard. With a popular sentiment that stands with Palestinian freedom, but a government motivated to increase military and economic alliances with the Israeli state, the Greek State shows us the contradictions between liberatory ideology and its institutional form. It shows us the paradox of the nation state and the people. But all the worlds of difference that meet in Athens generate a more profound possibility to revolt with a new political frame, because it is necessary. In the beginning of this essay, I spoke of the Palestinian refugee youth from Ein El Hilwa camp who told me of his time working in Greek refugee camps. He says, “Being here, in these camps, I see the children pick up these English words from the Western volunteers. I hear them say “hello, my friend” goodbye, go, yes, no problem” and for the first time, I can actually picture where my grandparents, survivors of Al-Nakba picked up their few English words. It feels like 1948 all over again. We always imagined 1948 as a dystopic past. But it is here and now, and I am witnessing its sobering reality.” If time has collapsed and back then is right now, if space too has colluded and the camps in Athens are no different than the camps in Lebanon, Syria, Jordan, Palestine or anywhere else, then perhaps we would do well to situate our rage within these realizations. 2018 marked the 70th year anniversary of the Palestinian Nakba, the 50th anniversary of the 1968 global student, labor, anti-war and national liberation movement strikes and the 10th year anniversary of the global and Greek economic crisis. As movements ripened with possibility, little has been achieved. Perhaps 2019 will usher in a wave of critical possibilities for a re-ordering of the world. Catastrophe on such mass scale has produced unifying senses of despair and rage that can truly bring together causes, coordinates and generations. From Athens to Jerusalem and all the places in between and beyond, crisis prevails, opportunity is emergent. In all places, suffering is salient, rage is culminating, and young people experience the exhaustion of despair and rage in exorbitant ways. But in all places, especially among youth, a little more revolutionary strategy and collective direction are critical. 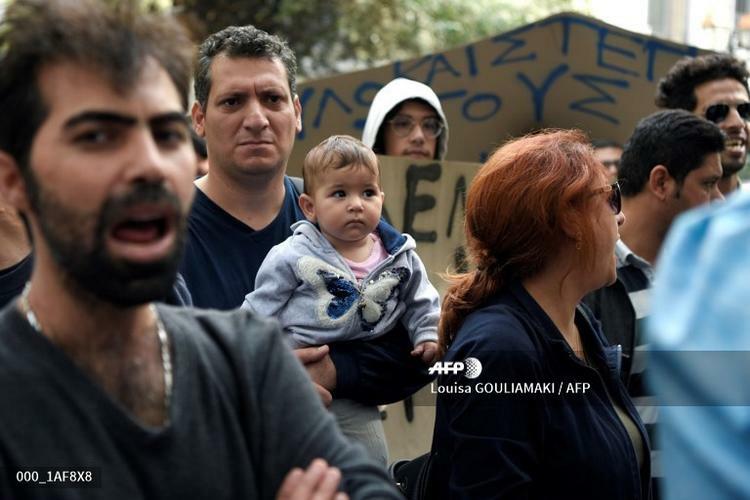 Featured Photo: Iranian refugees stage a sit in protest outside the ministry of Foreign Affairs in Athens on October 30, 2018 demanding their rights and a faster asylum process.Iranians of whom most have recently arrived in Greece demand rights including accomodation as many claim they have nowhere to stay. Louisa GOULIAMAKI / AFP. Loubna Qutami is a President's Postdoctoral Fellow in the Department of Ethnic Studies at the University of California, Berkeley. Her research examines the way refugee youth are forging new solidarities and linking service and political praxis as a result of multiscalar forms of dispossession, siege, and catastrophe they are enduring.